Welcome to Week 13 of Lessons Learned! In this article, we break down ten important takeaways from the prior week in fantasy football, and what they could mean for your lineups moving forward. If you learned anything from Week 13 that you think we should know, send us a comment or shoot me a tweet @FantasySensei! Without further ado, let’s dive into the fantasy classroom. I’ll give myself a B- on that headline pun, but I’ll give the Cowboys an A+ on their season turnaround. Their defense is elite, no ifs-ands-or-buts about it. They shut down the New Orleans Saints in Week 13, something that many would have considered impossible for just about any defense in recent memory. And that warrants bearing in mind when evaluating start/sits against this crew (hint: sit Alshon Jeffery, and try to pivot off Carson Wentz and Josh Adams if you can next week). But even more importantly, Amari Cooper has revitalized this offense, making Dak Prescott streamable again and earning himself a badge of trust from yours truly. That’s right, I’m willing to plug Cooper in as a strong WR2 moving forward (and especially against the porous Eagles secondary in Week 14). How ’bout them Cowboys?! We knew coming out of the draft that Josh Allen could chuck a football over a mountain range. And we knew that he was mobile, at least on a Russell Wilson, Alex Smith sort of level. Turns out, he’s mobile on a Michael Vick, Todd Gurley sort of level. Allen followed up a beastly 99-yard rushing day in Week 12 with an absolutely mind-boggling 135 rushing yards in Week 13, the most in a game by a QB since Colin Kaepernick in 2014. On top of that, he actually added more than 13 points through the air last week, which was good enough with his rushing to make him elite. This week, he gets the Jets, who just allowed 40+ yards on the ground to Marcus Mariota, and were legitimately schooled through the air by Matt Barkley the last time these teams met. Allen is a legitimate streaming option, and I’d consider him over Tom Brady, Jared Goff, and Kirk Cousins this week, just to name a few. At me. 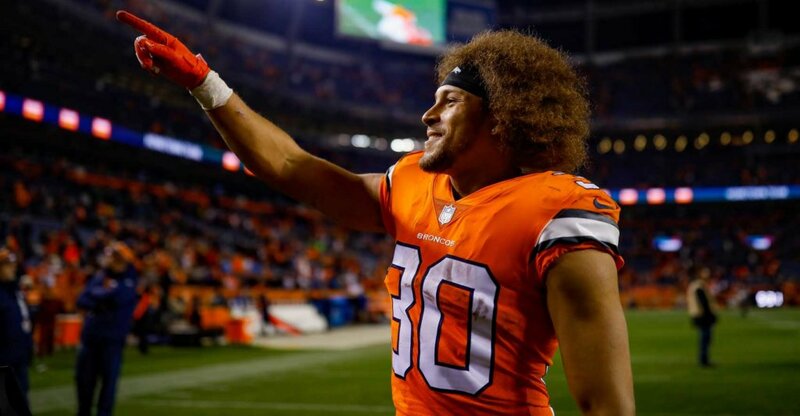 Lindsay was already teetering on the edge of fantasy greatness before last week, but then he absolutely handled the Cincinnati Bengals on the road. The undrafted rookie running back tallied 157 rushing yards and 2 touchdowns, moving into the top 10 among all fantasy running backs on the season. And to clarify, three of the guys ahead of Lindsay in fantasy points this season are not playing at the moment (James Conner, Melvin Gordon, and Kareem Hunt). That makes Lindsay a locked-and-loaded RB1 at this point, especially with a gorgeous stretch of matchups against the 49ers, Browns, and Raiders. If you have him, mazel tov. If you don’t, pray you aren’t facing him in the fantasy playoffs. Hopefully, Godwin and DJax don’t have the same agent, or this would be embarrassing. Regardless, the fact of the matter is that Godwin has played absolutely lights out football every time that DeSean Jackson has sat. And it’s pretty much spelling the end for Jackson’s career in Tampa Bay. After last week, Godwin has now played 3 games in his career without Jackson (dating back to Weeks 16-17 last season). In those games, the young wideout has totaled 15 catches, 310 receiving yards, and 2 touchdowns. In that (admittedly tiny) sample size, he has averaged 16.8 half-PPR fantasy points, which would be the WR5 this season. You heard me. He is a legitimate must-start this week against the Saints, before drawing a couple deadly matchups against the Ravens and Cowboys. Play him while you can. Apparently, all David Johnson and Sony Michel owners angered the fantasy gods this past week, as we were cursed with multiple vultured touchdowns for each guy, courtesy of Chase Edmonds and James Develin. If you haven’t heard those names before, that’s exactly the point. Sometimes this happens, and sometimes smart coaches know that their opponent knows that DJ and Michel are the obvious choices (just as fantasy owners know) … y’know? All that said, the lesson here is simple: don’t freak out. These were both flukey results that I don’t expect to see again. Johnson and Michel are strong RB2 options, shake it off and put them in your lineups. 6. The Mike McCarthy Firing is Salvation for Aaron … But Which One? Spoiler alert: it’s not Aaron Rodgers. That’s right, I am of the opinion that the move away from Mike McCarthy is not going to revitalize Rodgers’ disappointing season, despite the intense wave of hope it created in Rodgers owners everywhere. Why you ask? Well, the final straw (a loss versus the Cardinals) was a microcosm of the answer. McCarthy’s Packers bungled a game plan that featured 11 Aaron Jones carries, 7 Jamaal Williams carries, and 50 Rodgers passes. And it resulted in 325 total yards, 17 points, and a loss. Moving forward, I think we see a much heavier dose of Aaron Jones (because it’s the right choice), with Aaron Rodgers taking a more measured, efficient approach through the air. I think Rodgers gets a bit more reliable but does not return to his QB1 self immediately. Meanwhile, Aaron Jones will carry league-winning potential in your RB2 slot through the course of the playoffs. I really didn’t want to write this one into existence, because I really don’t think Miller is that talented. But the fact is, in this offense and on this blazing hot team, he is good for fantasy right now. Miller has now posted 85+ rushing yards in 5 of his last 6 games and has averaged 117 per game over his last 3 contests. He’s also scored thrice (pronounced with a British accent), in that stretch, benefiting from the dominance of a Texans team that has now won a franchise-record 9 straight games. Simply put, this team is good, this offense is good, and they are winning — a lot. That’s a strong recipe for any starting RB, and Miller is a 15-20 touch bell-cow with a great schedule to end the season. Ugh. We’ve reached this point, folks. The point where the tight end position is so barfy that Jared Cook is the No. 5 option in all of fantasy. Yup. The only tight ends who have outscored Jared Cook this season are Travis Kelce, Zach Ertz, Eric Ebron, and George Kittle. 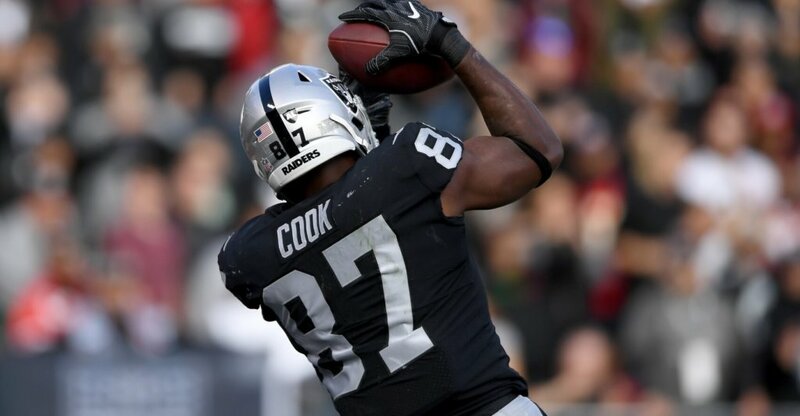 Cook hauled in 7 receptions for 100 yards and a touchdown last week against the Chiefs and essentially leads a receiving corps that, despite Jordy Nelson‘s valiant return, is bare as can be. Cook is worth 5 catches for 60+ and a touchdown every other week, which is more than you can say of almost anyone in this landscape. And he’s got a decent schedule coming up, including the atrocious Bengals in Week 15. He should be 100% owned and started. And we should be allowed to play receivers weighing 240 pounds or more as tight ends. I’m looking at you Kelvin Benjamin. If you got that reference, props to you my cultured friend. (If you didn’t, it’s funny because Dante wrote the famous poem Inferno … get educated and also bodied!) And more importantly, Pettis is on fire. The rookie receiver out of Washington caught 5 balls for 129 yards and 2 touchdowns last week, in an encore of his 77-yard, 1-TD performance from the week before. While fellow 49ers receiver Marquise Goodwin is practicing again, I don’t think that will kill the remaining value for Pettis. He is playing too well to relegate and has had time to build a rapport with QB Nick Mullens that Goodwin hasn’t. With that said, Pettis does draw a relatively tough stretch of matchups, including the Bears in championship week, so tread lightly. But if you need a spot-start receiver with upside, you could do worse. What if I told you that Russell Wilson threw four touchdowns in Week 13 on only 11 completions and that Tyler Lockett scored double-digit fantasy points on just one catch? Well, I just did. So. There you go. This duo has been downright silly this season, with Wilson throwing just over 1 TD per 10 attempts since Week 6 — second-best rate in the league to only Patrick Mahomes — and Lockett scoring every 4.8 receptions. For perspective on Lockett, he is currently on pace for 12 touchdowns on only 59 receptions. If he makes those marks, he will be only the fifth wide receiver to do so since 1990. I would tell you that they’re due for regression, but at this point math simply does not matter. Keep starting both unless you’ve got auto-start names ahead of them.